…I’m sure there’s a giant blob letter in some language Ibrahim. You’ll find it buddy. If anyone can, Ibrahim can. They ain’t in Kansas anymore! Or ever were, really, but whatever. If it were Diwani script, he might be able to turn it into a really, really big ornamental curlicue or something. But alas, tis not the case! Alas! Maybe he can turn it into a Hidden Mickey. Oh man this is exciting! I think Arabic looks so beautiful when written. Haha. Thank you! Yeah it really is beautiful even when just scribbled by a person who can’t read or write the words! Some of the real, genuine calligraphy is amazing. Ooooo, this is so pretty! I love all the bright hues. Do the words you chose mean anything? Thanks! You mean the words Ibrahim is writing? They were taken from some of Plato’s stuff. Hopefully they at least look like real words to people who can read them! I’d be more than happy help you out with Arabic text if you’d like, though calligraphy would be beyond me. 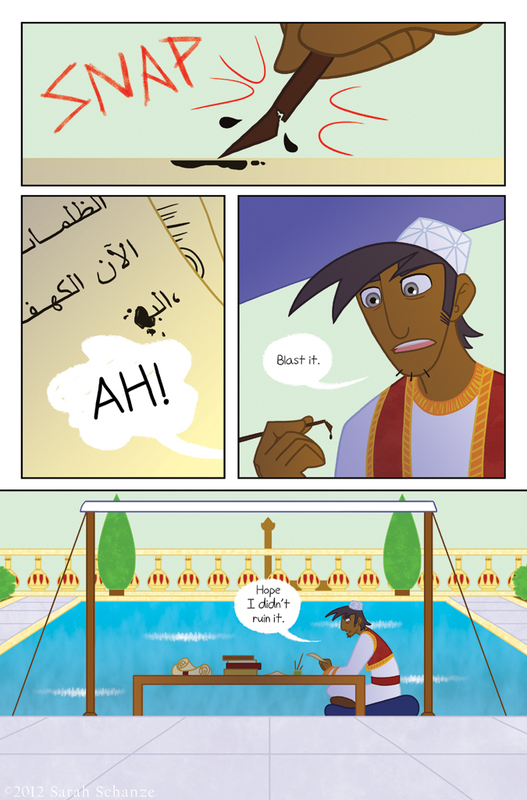 Ibrahim is actually pronounced, with a tiny pause at each dash, eb-ra-heem. Deriving from it is the name Abraham, such as Abraham Lincoln. And he appears to be a scholar of sorts? Yeah, I can tell he and Cole are going to get along just fine. Hahaha, yeah like fire and water. OH SNAP! the quill broke! Ah, the perils of a reed pen! I love this, I love you, and I love that there’s a bookworm in here! I have a thing for books (and Arabic).